Striker Andre Gray hopes to give the fans what they want – victory in the derby at Blackburn tomorrow. But he insists eyes should be on the prize at the end of the season, and not just the bragging rights in one game. 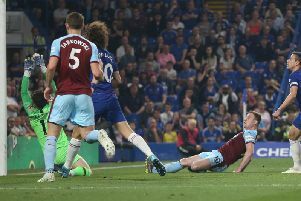 Manager Sean Dyche and his players know the importance of the fixture to the supporters, but will try and treat it as just another game in a 46-match league campaign. And Gray – who scored in both games he played against Rovers last season for Brentford – admitted: “It will be a tough derby at Blackburn. “We just need to keep getting results and working hard and hopefully just keep this momentum. “But It’s another game for us. It’s more important for the fans I feel. “It’s a long season, so if we don’t win there it’s not the be all and end all. “We lost to Reading the other week and we’ve come back from that with two wins and a draw, so we’re going to lose games, that’s football, it’s how we bounce back. “Games like Blackburn, they could be bottom of the league and we could be top, it’s going to be a difficult game. Gray is top-scorer for the Clarets with four goals so far this season in six starts, on top of the two he scored for the Bees before making a club record £6m switch to Turf Moor. He has already become a firm favourite with the supporters, who have been urging him to shoot down their old enemy at Ewood Park. Gray explained: “There were a few tweets the other day. There were people asking me if I’d rather score against Blackburn or be top goalscorer this season – things like that. I said I’d rather do both. “It’s a marathon not a sprint so if we did lose at the weekend, it’s not the end of the world. “The whole team gives their all win or lose, the fans know that as well, that’s why they support us so well because we give our all no matter what.